Wichita Northwest returned just one starting offensive lineman, senior right guard Gage Fletcher, from a 7-3 squad that finished third in Class 6A in scoring offense at 39 points a contest. However, the offensive line’s improvement helped Northwest deliver a huge upset, 31-24, against Bishop Carroll in the season opener last Friday. It marked the first time Northwest had beaten its rival since 2005, and produced Carroll’s first City League loss since a 45-14 defeat against Heights to open the 2011 season. Carroll, ranked No. 2 in the Class 5A preseason poll, was 36-1 in the past three years. Last season, the Eagles had an average score of 52-5. Northwest helped cause a massive shakeup in the Class 5A ranks. No. 1 Aquinas fell 38-20 to previous No. 5 Mill Valley. No. 3 Salina South, hurt by turnovers early and late, lost 14-7 to unranked McPherson. No. 4 Blue Valley West fell 35-14 to Lawrence, a top-5 6A squad. Mill Valley is now ranked No. 1 for the first time in school history, followed by Aquinas, Carroll, Kapaun-Mt. Carmel and Pittsburg. Northwest has another big test at Kapaun on Friday. Carroll has finished first or second in the City League in all 20 years under coach Alan Schuckman. This season, the City League is especially strong with Carroll, Northwest, Kapaun, Heights and Wichita West. Northwest stands in the top-9 in Class 6A. The Grizzlies are 9-2 in the last 11 years versus the Crusaders, but just 3-2 in the last five seasons, including a 48-31 victory last fall en route to a second place City League finish. Martin was worried about a letdown in practice early this week following the big win. He was pleased with his team’s focus Monday and Tuesday. “Our kids understood, they know the gauntlet that we have these first two games are very tough,” Martin said. The line features four seniors and one junior, Joey Gilbertson, the starting left guard. Gilbertson played defensive line for Northwest and then grew two inches. Martin and the coaching staff thought he was going to be too large to play defensive line. Junior Jahlyl Rounds and senior Antonio Joyner both had strong games at running back. The two doesn’t have the track speed of KeShaun McGaugh and Deron Thompson from the last two seasons, but Martin said the duo fits the offensive mold and runs inside zone with a physical style. Rounds finished with 15 carries for 79 yards and two scores, including the eventual game-winner with 2:26 left, and hauled in seven catches for 76 yards. Joyner tacked on 12 carries for 49 yards. “They believe in each other, and they block for each other,” Martin said. Senior quarterback Kevin Folsom is the team leader and delivered a standout performance after he missed most of 2014 because of an injury. Folsom completed 19 of 27 passes for 219 yards with one score. He also rushed 24 times for 129 yards and a TD. Northwest’s fast offense ran 80 snaps for 466 yards. Last season, Northwest fell 43-14 to Carroll and ran 70 snaps for 300 yards. As a team, the Grizzlies averaged 59 snaps for 435 yards per game last fall. “Our kids feed off of Kevin,” Martin said. Defensively, Martin gave credit to multiple players, especially his defensive line. Senior Branden Ho had five tackles, three for loss. Senior Brandon Shook collected four tackles, with a .5 tackle for loss. Senior Duall Watson had two tackles, one for loss, and junior Luke Carter tallied four tackles, 1.5 for loss. Senior Nick French, a Colorado transfer, had two assisted stops and a .5 TFL. Overall, the Grizzlies had 12 tackles for loss as a team. Senior Adrian Cook delivered seven tackles (2 TFL) at middle linebacker. Junior safety Emilio San Roman led the squad with 11 tackles, including seven solo, and helped end Carroll’s last chance on a turnover on downs. This Friday, though, brings another strong test for Northwest. Mill Valley bumped to No. 1 for the first time in program history with its 38-20 win versus Aquinas. Senior quarterback Logan Koch finished 12 of 18 passing for 145 yards and two scores. “Logan is a very dynamic kid,” Mill Valley coach Joel Applebee said. “He can do a lot of different things. He just has a natural instinct of understanding what schemes are allowing him to do, and he does a great job of exploiting those when he needs to. Senior Christian Jegen had nine catches for 117 yards and a TD, including a 29-yard scoring pass. Applebee, an assistant at Derby before he took over at Mill Valley, said the last player he saw with Jegen’s all-around ability was Derby’s Devin Hedgepeth, who eventually went to Oklahoma State. 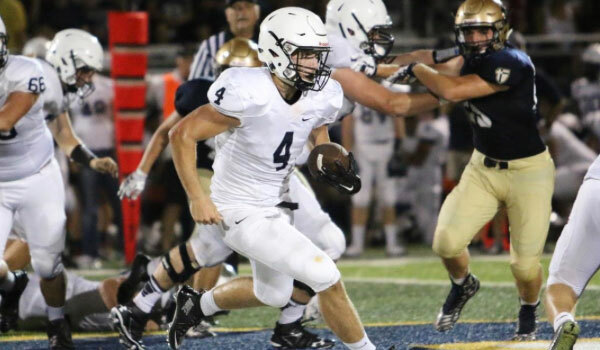 Jegen is a great leader on and off the field for Mill Valley. “A lot of our kids can look at him, especially our young kids, and see what it takes to play on a high level week in and week out,” Applebee said. Tragedy occurred for Victoria and its all-state senior/quarterback safety Brady Dinkel after Friday’s 16-12 home victory against Central Plains. Dinkel started feeling problems shortly after the contest and went to the emergency room in Hays. Dinkel returned home and then went back to the ER early Saturday morning. He was eventually life-watched to Wichita with liver and pancreas issues. Coach Doug Oberle said Tuesday night it’s unclear what caused the problems for Dinkel, a three-sport standout and 19-2 as a starting quarterback. Victoria is the defending 8-man II state champions and ranked No. 1 in the classification this year. Dinkel has received great support and prayers from many, including players, area coaches and the townspeople of Victoria. Oberle said senior Joe Dortland, a running back, will take over for Dinkel. The Knights are at Ellinwood on Friday.